The Children’s Fund isn’t about pointing fingers at parents falling painfully short of their responsibilities, or governments and organizations making unpopular choices in the face of rising demand and declining resources. This is about a child who, without our collective attention and intervention, might never achieve his or her best, might never have his or her eyes opened to the opportunities and wonders of the world. And so, as the season of giving is once again upon us, we are asking that you continue to place your trust in us, and put your contribution in our Adopt-a-School collection tray, so that this great legacy that we both started so many years ago is carried well into the future. We have big plans, and we know you’ll be right here with us. Help keep our kids fed, warm and learning. Your donation will change the lives of thousands of school children in Metro Vancouver and beyond, coming to school unfed, improperly dressed and suffering the psychological effects of living in poverty. Help keep our kids fed, warm and learning. 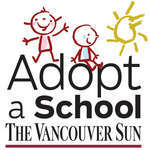 Your donation to The Vancouver Sun’s Adopt-a-School campaign will change the lives of hundreds of needy school children in Metro Vancouver.